One of the simplest, quickest and most effective ways to improve the appearance of your smile is with teeth whitening treatment. In fact teeth whitening can do far more than revitalise your smile – it can revitalise your self-image, your mannerisms and the impression that you make on others. 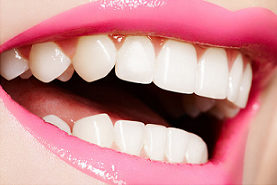 Our Teeth Whitening treatment provides immediate results and requires just an hour of your time. At the conclusion of this treatment, which is pain-free, fast and effective, your teeth will be up to eight shades whiter. Degree of lightness will vary from patient to patient. Some patients may need to repeat the procedure periodically to top up the effect. If there are any other dental problems they can affect the success of tooth whitening, for example, cavities need to be treated before teeth are whitened. That’s because the whitening solution can pass through decayed areas and reach the inner parts of the tooth. If your gums have receded, the exposed roots of your teeth may appear yellow or discolored. Whitening products will not make them whiter. ‘Edlesborough Dental Practice’ can provide you with teeth-whitening trays and gels that can be worn at home. These can be very effective, but results take longer to achieve than getting treatment done at our practice. We will take an impression of your teeth and give this to a dental technician, who will build a tray to the exact measurements of your mouth. We will check that the tray fits and demonstrate how to carry out the procedure at home. The tray fits closely around the teeth, and is filled with a whitening gel. Depending on the strength of peroxide in the gel, these trays are usually worn for a couple of hours a day or overnight. Treatment can take anywhere from three days to a couple of weeks. In market over-the-counter whitening kits are available, although we do not recommend using them as they use a generic sized tray, which could allow the bleaching agent to come into contact with your gums, causing irritation or any other side effects. Not only they are not made to fit your mouth exactly, it may also be the case that bleaching isn’t suitable for you, especially if you have gum disease or crowns. Proceeding with the treatment in these circumstances could be harmful. Don′t shy away from your smile any longer – take action and restore your smile′s youthful luster. To arrange a consultation regarding our teeth whitening options, contact ‘Edlesborough Dental Practice’ today. Our team can help you realise your dream of having a beautiful, bright white smile.